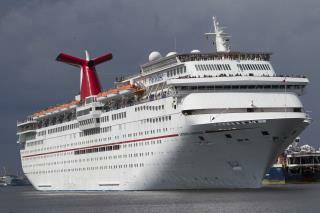 (Newser) – A cruise ended in tragedy Saturday morning when an 8-year-old girl fell to her death after the ship docked in Miami. CNN reports that the unnamed girl fell from the interior atrium of the Carnival Cruise Line ship Carnival Glory to a lower deck. The incident took place at about 8:15am Saturday, after the ship had completed its trip and returned to the Dante B. Fascell Port of Miami. A spokesman for the City of Miami Fire-Rescue said the girl may have fallen "20 or so feet from a landing." It's unclear what led to the fall, and homicide investigators are currently looking into the incident. Railings should be designed to prevent anyone from climbing or sliding on them or from going through or under them. We shouldn't allow ourselves to think that basic building design has already reached some sort of ultimate safety standard. The auto industry is constantly improving safety design and environmental impact and safety inspections have become much more comprehensive over the years. Residential and recreational design and construction should also be required to continuously improve, not remain static as though there is no room for improvement. So sad, but the story is only telling the ending. I wonder what the child was doing at the time. I wonder who was with her - where were her parents or whoever the adults were that she was traveling with?